सरला ठकराल........ भारत की पहली महिला विमान चालक. लाहौर हवाई अड्डा और साल 1936. इक्कीस वर्षीया सरला ठकराल ने अपनी साड़ी का पल्लू ठीक किया और जा बैठीं जिप्सी मॉथ नामक दो सीटों वाले विमान में. आँखों पर चश्मा चढ़ाया और ले उड़ीं उसे आकाश में...सुनने में एक परी कथा ही लगती हैं क्योकि यह वो समय था जब आकाश में उड़ना ही एक बड़ी बात थी. जहाज उड़ाना बहुत ही बड़ी चीज समझी जाती थी और ऊपर से पुरुष का उस समय इस क्षेत्र पर पूरी तरह से वर्चस्व था. इस तरह वो भारत की पहली महिला विमान चालक बनीं. सरला ठकराल ने 1929 में दिल्ली में खोले गए फ़्लाइंग क्लब में विमान चालन की ट्रेनिंग ली थी और एक हज़ार घंटे का अनुभव बटोरा था. वहीं उनकी भेंट अपने भावी पति से हुई. शादी के बाद उनके पति ने उन्हें व्यावसायिक विमान चालक बनने के लिए प्रोत्साहन दिया. सरला ठकराल जोधपुर फ्लाइंग क्लब में ट्रेनिंग लेने लगीं. 1939 में एक विमान दुर्घटना में उनके पति मारे गए. फिर दूसरा विश्व युद्ध छिड़ गया और जोधपुर क्लब बंद हो गया. उसके बाद उन्होंने अपने जीवन की दिशा बदल ली. उनके माता-पिता ने उनका दूसरा विवाह किया और वो विभाजन के बाद लाहौर से दिल्ली आ गईं.यहाँ आकार उन्होंने पेंटिंग शुरू की ..फिर वो कपडे और गहने डिजाईन करने लगी.और करीब २० साल तक वो अपने बनायीं चीजे विभिन्न cottage industries को देती रही. The year 1936 when the flying was like dream, flying in air was like miracle. There were only male in the cockpit of the airplane. At that time one lady entered the cockpit of a Gypsy Moth and flew into the blue skies, and made a history as India’s first lady pilot. The dashing, courageous, Sarla Thakral. She was only 21 year old when she achieved that sky. 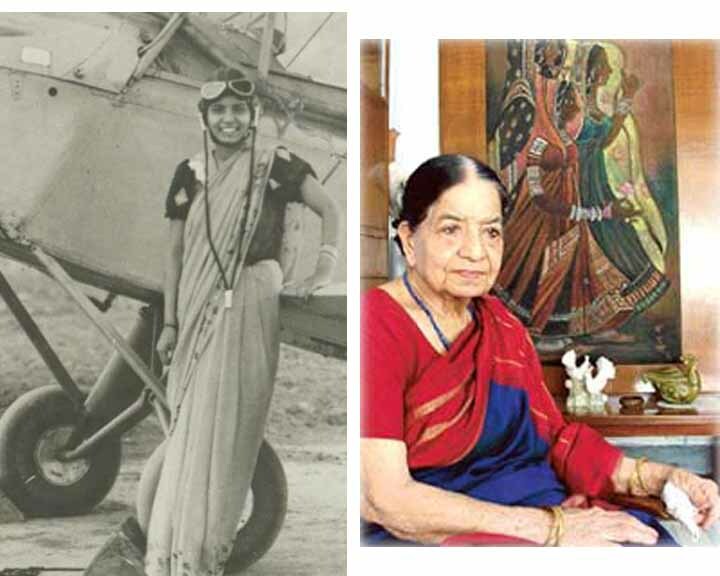 Her husband P D Sharma was the initiator behind that and father-in-law was the supportive of all the things. P D Sharm’s family after all had nine pilots already and they were all supportive of the decision. She obtained her ‘A’ license when she accumulated over 1000 hours of flying. She was looking for the group B license that would authorize her to fly as a commercial pilot. But when she was undergoing training in Jodhpur, unfaith happened. Her husband died in a crash in 1939. She widowed at 24. She abandoned her plans to become a commercial pilot. She joined the Mayo School of Arts in Lahore. But her parents re-married her and she settled in Delhi after partition. She succeeded in establishing herself as a renown painter. Most of her water colors have followed the Bengali School of Art. Along with paintings she also began designing clothes and costume jewellery. She supplied her jewellery designs to several cottage industries for over 20 years. She had also started textile printing and her sari prints were a rage with the fashionable crowd. One of the clients was Vijaylaxmi Pandit. Now she is 91 years old young lady still flying high in his life. “Every morning I wake up and chart out my plans. If there is plenty of work I feel very happy otherwise I feel a precious day has been wasted,” she says.